The Non-Locking Adjustable Foot Rest with Metal Base provides an 18" wide platform. 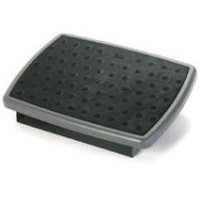 Non-Locking Adjustable Foot Rest with Metal Base (18" platform) has soft rubber non-skid bumps, and easy foot-controlled platform tilt adjustment. Both height and tilt are adjustable. It has a thin steel sheet base. Depth (front to back): 13.0"
Height: Minimum: 4.0"; Maximum: 4.75"